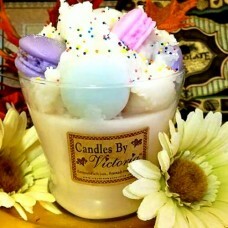 This precious candle is brand new to our Bake Shoppe line. We begin with an original house blend of Raspberry Lime Macaron. We then added a whipped layer of the same fragrance and finally we topped this candle with Macaron wax embeds that are also scented in Rasberry Lime Macaron and then we sprinkled on just a hint of glitter. We just adore this sweet candle and we hope you do as well.